Summary: Learn how to plasterboard a ceiling, remove old plasterboard, locate a joist and fix plasterboard to a joist. Nailing sheets of plasterboard to ceiling joists is the best way to fit a new ceiling. Pulling down the old ceiling and nailing the plasterboard to the exposed joists. Locating the position of the joists and nailing the plasterboard to them through the existing ceiling. It is best to work with your head 150mm below the ceiling, so you will need a scaffold tower or create a platform using scaffold boards firmly supported by a decorator's trestle at each end. If you do not have a stud/cable/pipe detector, lightly tap on the ceiling to find a solid area which will indicate the position of a joist, and pierce the ceiling with a bradawl to locate both edges of the joist. Move to the other end of the room and repeat the process of locating the edges of the joist. Run a chalked string line across the room between the two sets of holes to identify the edge of the newly found joist from which you can take measurements to locate the other joists. Ceiling joists are generally 400mm or 600mm apart. 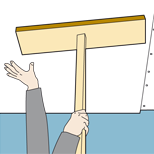 Use the bradawl to probe the ceiling to ensure you have found the edge of the next joist. Continue to mark the edges of each joist with the chalked string line until the positions of all the ceiling joists are clearly visible on the ceiling. 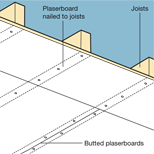 If planning to plasterboard an upper floor ceiling, you can locate the position of the joists from the loft but only if the joists are visible and not boarded over. From the loft push the bradawl through the ceiling on either side of the joist and at both ends of it. Measure the width of the joist and the distance between the joists. Returning to the room below, run a chalked string line across the room between the holes made with the bradawl. From this starting point you will be able to take measurements to locate and mark the position of the other joists. 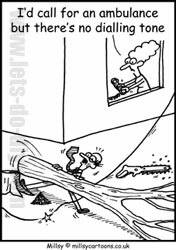 To avoid injury it is best to have someone to help you, as sheets of plasterboard are large and heavy and difficult to manoeuvre on your own. It is also recommended that you hire a panel lifter or make a deadman, which is a square piece of plywood or chipboard nailed to the end of a length of timber that reaches from floor to the ceiling. This is used to support the plasterboard when nailing. Starting at one end of the room, lift a sheet of plasterboard into position ensuring the length of the plasterboard is at right angles with the joists and the ivory side is facing down. The sheets of plasterboard should always end mid-joist, so each board will be firmly secured to the joists. This will involve cutting the plasterboard, which can be done with a fine-tooth panel saw. Alternatively you may wish to score a straight line across the back of the board using a sharp knife and a straight edge. Then bend the board in the opposite direction to the score mark and it will break along the cut. Finally slice the paper on the other side of the plasterboard for an accurate cut. Nail the plasterboard to the joists using galvanized plasterboard nails. The size of the nails will depend on the thickness of the plasterboard but remember if you are fitting the plasterboard over an existing ceiling the nails will need to be longer. 9.5mm thick plasterboard should be fixed with 30mm nails. 12.5mm thick plasterboard should be fixed with 40mm nails. The nails should be hammered into the joists at intervals of 150mm. As you progress across the room stagger the rows to avoid the boards ending on the same joists. Use a panel lifter or deadman to support the plasterboard when nailing. Nail the plasterboard to the joists remembering to stagger the rows to avoid all the boards ending on the same joists. When the new ceiling has been fitted the joints have to be covered with either lengths of scrim tape or self-adhesive joint tape. This is in preparation to plastering the ceiling. As you are working at height it is best to use the self-adhesive jointing tape, as the scrim tape requires plaster to fix it in place. Any gaps around the edge where the wall and ceiling meet can be filled with plaster or filler.